A crop of the cover for Thanos—Titan Consumed. Up until now, most of the information you wanted about the Marvel Cinematic Universe was in one place: the cinema. But this November, the MCU is expanding into another medium—books, with its first, officially canon tie-in novel. And it’s all about Thanos, the mad titan who’s about to wreck the Avengers’ entire world in Infinity War. Space. Reality. Mind. Power. Time. Soul. Only beings of immense power can hope to wield these stones, but for those who are worthy, the powers of a god await. Thanos is one such being. But he wasn’t always. Born on a doomed world and cast out by his people for his genius, physical deviancy, and pragmatic but monstrous ideas, Thanos is determined to save the galaxy from the same fate as his homeworld… no matter how many billions have to die. Learn the origins of the most formidable foe the Avengers, the Guardians of the Galaxy, Doctor Strange, and Black Panther have ever faced—a foe whom even a group of remarkable people, pulled together to fight the battles nobody else could, will fail to stop…. That last part, “a foe whom even a group of remarkable people, pulled together to fight the battles nobody else could, will fail to stop” kind of feels like a spoiler, no? After all, this novel does come out closer to Avengers 4 than Infinity War. Would Marvel ever let something like that slip in a book summary? We don’t know. But, if you’re like us, you have questions beyond that. So here’s our Q&A with Lyga. 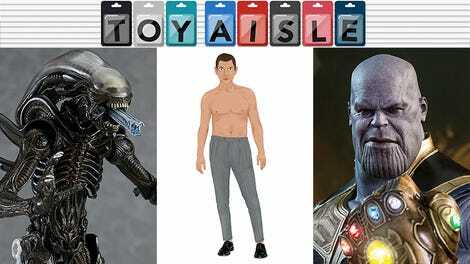 io9: The MCU is such a successful and massive canvas to come in and play on. Were you intimidated to be writing what is essentially the first official tie-in novel to these movies? Barry Lyga: Okay, I have to admit something here: Until you said “the first, official tie-in novel for young adults,” I actually had no idea that this was the case! I guess I just assumed that over the past 10 years there had been another one—at least one!—out there that I wasn’t aware of. So, I wasn’t scared or intimidated at all. But I guess now I am. Thanks! How much infomation were you given from Marvel Studios with regards to Thanos’ character and history? Lyga: I wish there were an exciting story to tell you, how an unmarked van pulled up to my house in November and three large men stun-gunned me into submission, then dragged me off with a hood over my head. And when I woke up, I was on a helicarrier with the Russos as Nick Fury watched over us, attentive to my every move. But, no—it works pretty much the way you’d think. My editor and I had a lengthy conference call with the folks at Marvel Studios. They started off with a sort of outline of who Thanos is and what he means to the movies, and then I got to ask my questions, some of which were worthwhile, some of which were impertinent, some of which were just designed to see if I could trip them up and get Tom Hiddleston’s phone number. They were a discreet and disciplined bunch—I couldn’t get anything un-Thanos-related out of them, drat the luck! As the book started to take shape, we would check in occasionally to ask questions that cropped up. I’m trying to avoid spoilers here, so I’ll just say that in some areas I was given great latitude and a free hand, while in others I had to tip-toe very carefully through the MCU. It’s just the nature of the beast. A moment of quiet for the Mad Titan. Assuming we see some of the incidents that set him on his particular path, did you struggle with making Thanos seem at least a little sympathetic? Lyga: I wasn’t overly concerned with how to make Thanos sympathetic. I went into this already knowing the end—Thanos turns into a massive powerhouse with plans to kill half the universe. “Thanos is the most powerful being in the universe!” Korath says, and he’s a guy who looks like he knows whereof he speaks. We all know where Thanos is going to end up. We’ve seen the trailers. I wanted to show how we get there. That’s just an enormous amount of confidence, of persistence, of dedication. Most people wouldn’t even get to the idea of killing half the universe in the first place. Thanos did. And then he took it a step further. And a step further than that. Why? How? I wanted those logical leaps to fall into place. 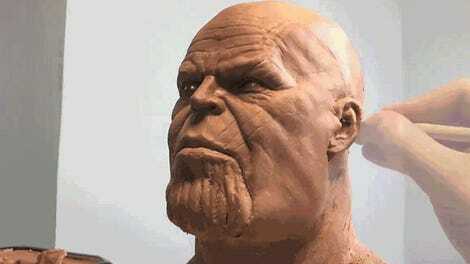 For his path to be so rational and so sensible that you would read the book and say, “Well, I personally don’t want to kill half the universe, but I completely understand why Thanos does, and it makes perfect sense, and I don’t see how he could turn out any other way.” A sense of inevitability, really. If you sympathize with him during his journey, that’s great. But what I really want is for you to see how he got to this point. 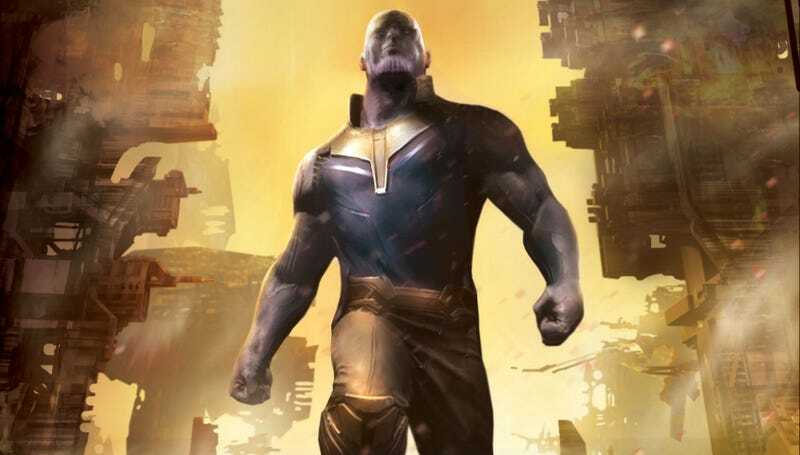 How much of Thanos’ history in the comics—as a descendant of the Eternals—has been transitioned over to MCU Thanos? Will other Titans like Starfox make an appearance? And most importantly, is he still trying to date the personification of Death? Lyga: [Since]I don’t want to reveal too many spoilers, I’m gonna have to keep my lips sealed on this one. Thanos does not look happy here. We’ve already seen Thanos in a few MCU movies. Will this novel touch upon or contextualize those appearances? Lyga: That was one of my main goals in the novel and, in fact, was the main reason I agreed to write it! I really hope that certain bits in the book will make people go, “Oh, so now that cool scene from that one movie is even cooler!” I really wanted to reverse-engineer those moments we’ve all seen already—in Guardians, in Avengers—and show how we got to them. How much do the Infinity Stones and Infinity Gauntlet play into this story? Lyga: A Thanos story without the Infinity Stones is like a day without sunshine. Anything more is serious spoiler territory. Marvel’s Avengers: Infinity War: Thanos—Titan Consumed by Barry Lyga will be released November 20 both in hardcover and eBook formats.